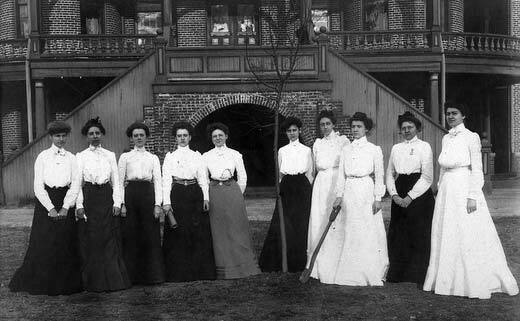 Meredith has experienced plenty of change since the College began educating the South's brightest women more than 127 years ago. Our enduring commitment to innovation and fresh perspectives over the years has allowed us to confidently grow and adapt our programs - and keeps us going strong. Thomas Meredith, founder of the Biblical Recorder, calls for an institution to provide "a first-rate course of female education." After a delay because of the Civil War and Reconstruction as well as the general lack of interest in women's education, Leonidas Polk introduces a resolution to the Convention for a Baptist female college. His resolution is adopted unanimously. The state legislature grants a charter for the Baptist Female University. To raise money for the school, Oliver Larkin Stringfield begins traveling across the state and Fannie E. S. Heck organizes the Woman's Executive Committee of the Baptist Female University. Economic conditions in the 1890s make fundraising difficult and donations often are small, many one dollar or less. Construction begins at the corner of Edenton and Blount streets in downtown Raleigh. Adolphus Bauer, who designed the governor's mansion, is the architect. Baptist Female University opens in September with 19 faculty/staff members and more than 200 students. James C. Blasingame is president. A college year is three terms of three months each. Room and board costs $36 per term, and tuition is $17.50, with additional fees for music and art. President Blasingame resigns after one year and Richard Tilman Vann is chosen to lead the University. Vann was a respected pastor and teacher. The first ten students graduate in May. These women are referred to as "The Immortal Ten" (pictured above). Trustees change name from Baptist Female University to Baptist University for Women. Students publish the first yearbook, Oak Leaves. Student government, one of the first in the South, is initiated. The tradition of the hiding of the Crook begins. In 1900, there had been a debt of $43,000, but by 1907, the University has an endowment of $37,000 and has grown to include six buildings and a library of 2,000 volumes. Students publish a literary magazine, The Acorn. To honor Thomas Meredith, trustees change the name to Meredith College. After 15 years, President Vann (who wrote the words and music to Meredith's "Alma Mater") retires. During his presidency, enrollment increased to almost 400 and the endowment to $127,000. Charles Edward Brewer, professor of chemistry at Wake Forest College, is selected as the third president. 1915 also is the first year of Stunt. Student handbook contains a welcome letter to "Little Sis Class." Meredith is admitted to Southern Association of Colleges and Schools. The Twig, the student newspaper, is published. It is renamed Meredith Herald in 1986. Kappa Nu Sigma, scholastic honor society, is organized on campus by Dr. Helen Hull Law, professor of Latin and Greek. Graduates become eligible for membership in the American Association of University Women. The faculty presents the inaugural Alice in Wonderland to entertain their students, a tradition on campus that takes place once every four years. Construction of a new campus begins on Hillsborough Street. In January, students return from winter break to the new campus, which features six Georgian-style buildings that form a quadrangle: an administration building, a cafeteria, and four residence halls. Association of American Universities places Meredith on its list of approved colleges. President Brewer retires. He oversaw the construction of and move to the new campus and increased enrollment to almost 600 students. Dr. Carlyle Campbell is named the fourth president. Baptist State Convention rejects proposals to merge Meredith and Wake Forest College. The first Cornhuskin' is held at Meredith. The Honor Code is adopted. Grimmer Alumnae House is built. The house was relocated from its original location on campus to accommodate the construction of the Science and Math Building. Joyner Hall for liberal arts is completed. Hunter Hall opens for science classes. The building is renovated and renamed Martin Hall in 2004, in honor of Margaret C. Martin, '30. Brewer House is built for home economics students. Today it is used as an infant care teaching lab. Carroll Health Center and Poteat Residence Hall are completed. Dr. Norma Rose is the speaker at the first Faculty Distinguished Lecture. The newly completed McIver Amphitheater is used for Class Day. Dr. Campbell steps down. During his 27-year tenure, enrollment increased to nearly 1,000 students. Dr. Bruce Heilman becomes Meredith's fifth president. The first African American students enroll at Meredith. Gwendolyn Matthews Hilliard, '71, is the first African American student to graduate from the College. The library moves from Johnson Hall to the new Carlyle Campbell Library and a sixth residence hall, Heilman, is added. Weatherspoon Physical Education Building opens. Dr. Heilman resigns as president. He is credited with continuing high academic standards, increasing faculty compensation and the number of faculty with doctorates, and expanding the student body by 44%. Dr. John E. Weems becomes Meredith's sixth president. Two new buildings are added to campus including Massey House President's Residence and Barefoot Residence Hall. The Continuing Education Program begins. The Cate Student Center is dedicated. Meredith names first female vice-president, Dr. Sandra Thomas. Meredith begins to offer summer study abroad programs. Varsity volleyball program is launched. Wainwright Music Building is dedicated. Sir Harold Wilson, former Prime Minister of the United Kingdom, is the speaker at the first Lillian Parker Wallace Lecture. The lecture series continues to bring notable speakers to campus, which have included Nobel Laureate and Holocaust survivor Elie Wiesel, former U.S. President Jimmy Carter, and Associate Justice of the U.S. Supreme Court Sandra Day O’Connor. Jones Chapel and Harris Building are completed. Meredith College becomes a full member of NCAA Division III. Meredith begins offering master's degrees in business, education, and music. Meredith is chosen to participate in the North Carolina Teaching Fellows Program. When funding for the state program ends in 2012, Meredith launches its own program, the Meredith Teaching Fellows. The Graduate Program is named the John E. Weems Graduate School after Meredith's sixth president. The school offers advanced degrees and certificates for men and women. Meredith celebrates its centennial anniversary. The Class of 1992 begins the Ring Dinner tradition. Varsity soccer program is launched. Meredith and Baptist State Convention formally redefine their relationship. Dr. Weems' presidency ends after 27 years in service. During these years, the size of both the student body and the faculty nearly double. Dr. Maureen A. Hartford is chosen as Meredith's seventh president and becomes the College's first female president. The Park Center Mural is completed. This project, financed by the Class of 1997 and honoring the achievements of 100 alumnae, celebrates Meredith's powerful heritage. Through the leadership of Elizabeth Triplett Beam, '72, and Ione Kemp Knight, '43, the Alumnae Legacy Steering Committee begins work on establishing Meredith's first full-tuition merit scholarship. Meredith is the first women's college in the nation to become a campus-based site for the LeaderShape® Institute. Meredith Technology Initiative begins, providing laptop computers for students. Four men graduate from the MBA program, becoming the first men in the College's history to earn degrees. Science and Mathematics Building opens, and President Hartford introduces four initiatives: Science and Mathematics, Undergraduate Research opportunities, Meredith Technology, and Service Learning and Leadership. Meredith remains the Southeast's largest private college for women. The Campaign for Meredith, the College's largest fundraising initiative, enters its public phase with a goal of raising $33.5 million. Cross Country is added to the College's athletic offerings. The Campaign for Meredith concludes, raising more than $41.5 million. The campaign exceeded its goal by over $8 million. The Alumnae Legacy Steering Committee awards the first Meredith Legacy Scholarships to Sarah Beth Phelps, '11, and Erin Huber, '11. Meredith Avenging Angels join the USA South Conference. Meredith opens a permanent international site in Sansepolcro, Italy. The largest first-year class in the College's history enrolls. The newly constructed LEED-certified apartments, The Oaks, and athletic field and track complex open on campus. The School of Business earns Association to Advance Collegiate Schools of Business (AACSB) accreditation. 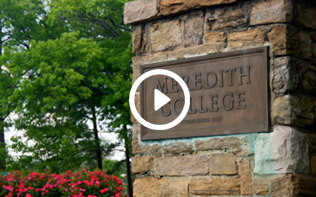 Meredith is only one of two women's colleges in the world accredited by AACSB International. President Maureen Hartford retires, ending her 12-year tenure. During these years, Hartford led efforts to strengthen academic offerings, expand and enhance campus facilities, improve the diversity of the student body, and increase the College's endowment. Dr. Jo Allen becomes Meredith's eighth president on July 1, 2011. President Allen is the first Meredith alumna to hold the office. The Board of Trustees approves Meredith Forever, the College's three-year rolling strategic plan. Lacrosse is added to the College's athletic offerings. The first TEDx Meredith College is held on campus. Meredith launches the Meredith College | Going Strong brand initiative. The College announces StrongPoints™, a defining element of the Meredith College educational experience.